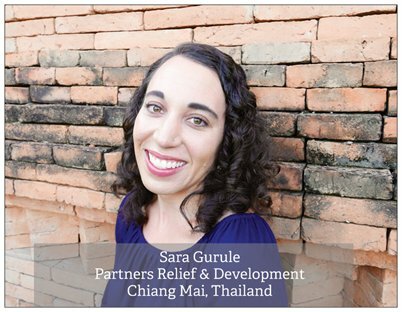 If you could please prayerfully consider journeying with me and supporting my work with Partners Relief and Development in Chiang Mai, Thailand I would be humbled and eternally grateful. I cannot do this alone. I need support at both the prayer and financial levels. Best, Fastest, Easiest way to give monthly and one-time gifts-- click HERE!!!!! If you would like to commit to monthly prayer support please email me at sgurule@teachbeyond.org to receive more information about how to get involved through prayer. I will also have prayer cards to give out soon and requests and needs posted on this site. I am in desperate need of financial supporters who are willing to donate $10 or more a month for the next two years. My financial support goal is $1,500/month So that equals out to be $18,000 for the year. In order to purchase my plane tickets, I'll need to have raised all of my start-up expenses (plane tickets, shipping items, purchases for my house) estimated to be $4,000, as well as have at least 90% of my monthly support pledged. I understand there are time constraints, but I am grateful for every bit that you can help me with. If you would like to donate, please click on the following link. When you reach the TeachBeyond giving page click on USA and you may choose whether you would like to make an automatic monthly gift or a one-time gift. I would advise donors to truly consider supporting me monthly (a lot easier for you automatically online and a lot more helpful for my goal). All gifts are tax deductible :) Please let me know if you have any questions on how giving works. I can access a monthly stipend or amount through my TeachBeyond account. Monies will be used for teaching supplies and monthly living and transportation costs. I also have tear off giving cards attached to my support letter and extras available along with a return-address envelope to anyone who would like to send a check to Teach Beyond by mail. With checks, Please make it out to TeachBeyond but do not put my name on the memo line. Fill out the giving card instead or label a sticky note with my name and put it in the envelope. This is for IRS purposes. Thanks! I would also love to meet with as many of my supporters as possible before I leave and tell you in person how appreciative I am! Please contact me with any questions or if you need clarification.